Part Of Lorell'S Wellness By Design Collection, This Accucel Executive Chair Is Office Seating Approved By The American Chiropractic Association. Lumbar Accu-Pressure Promotes Increased Circulation. Accucel Technology Provides Targeted Comfort And Support. Dense, Eva Convoluted Foam In The Lower Back Area Features A Durable Open-Mesh Covering. Luxurious, Black Bonded Leather Upholstery Provides A Sleek Look. Functions Include Pneumatic Seat-Height Adjustment From 20-1/2" To 24-1/4", Tilt (From 102 To 119 Degrees) And Tilt Lock. Arm-Integrated Fingertip Controls Allow Easier Seat Height And Tilt Lock Adjustment. 26" Five-Star Nylon Base Is Equipped With 1-24/25" Diameter Dual-Wheel Casters For Easy Chair Movement. Seat Measures 21" Wide X 18-1/2" Deep X 6-1/2" Thick. Back Size Is 24-1/4" Wide X 27-1/4" High X 6-1/4" Thick. Executive Chair Meets Or Exceeds Bifma Standards. Weight Capacity Is 275 Lb..
Part Of Lorell'S Wellness By Design Collection, This Accucel Executive Chair Is Office Seating Approved By The American Chiropractic Association. Lumbar Accu-Pressure Promotes Increased Circulation. Accucel Technology Provides Targeted Comfort And Support. Dense, Eva Convoluted Foam In The Lower Back Area Features A Durable Open-Mesh Covering. 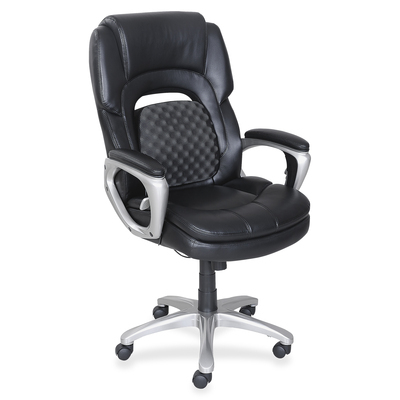 Luxurious, Black Bonded Leather Upholstery Provides A Sleek Look. Functions Include Pneumatic Seat-Height Adjustment From 20-1/2" To 24-1/4", Tilt (From 102 To 119 Degrees) And Tilt Lock. Arm-Integrated Fingertip Controls Allow Easier Seat Height And Tilt Lock Adjustment. 26" Five-Star Nylon Base Is Equipped With 1-24/25" Diameter Dual-Wheel Casters For Easy Chair Movement. Seat Measures 21" Wide X 18-1/2" Deep X 6-1/2" Thick. Back Size Is 24-1/4" Wide X 27-1/4" High X 6-1/4" Thick. Executive Chair Meets Or Exceeds Bifma Standards. Weight Capacity Is 275 Lb.